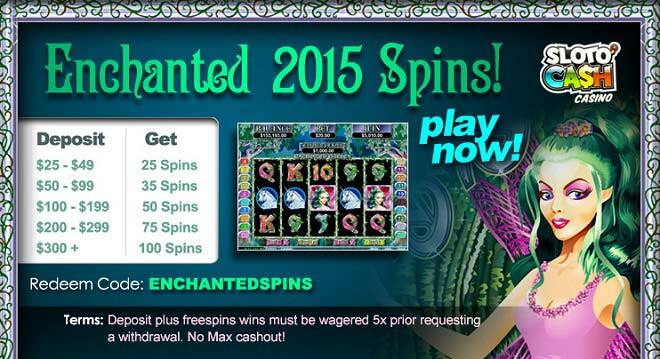 Charm, Magic and 100 Extra Spins are Waiting for you! There are many magical things going on at Sloto Cash Casino everyday; however, none like the Enchanting Garden slot game! Play this otherworldly slot today and redeem up to 100 free spins on every deposit you make this month! This delightful promotion is available on your computer or preferred mobile device play and it holds 5x slots, keno or scratch cards playthrough ONLY! For your deposits as low as $25 you'll receive a charismatic amount of free spins that will create even more magical wins your way! Discover a secret garden packed with symbols like Fireflies, Fairies, Magical Butterflies, Unicorns, Fountains and many others. This 5 reel and 20 payline game can be played for as little as $0.01 and up to $5! Enter the Enchanted Garden for more chances of winning than ever before. The wild symbol in this fun game is the Fairy image and randomly makes an appearance on reel 1 substituting for all other symbols and doubling the payouts. The scattered Garden symbols trigger the free spins round and during this bonus feature some of the symbols will trigger even more free spins for extra winnings! Get lost in the reels of Enchanting Garden for a blissful time while you watch the reels spin wins your way!